Governor Culver talks about his jobs program. 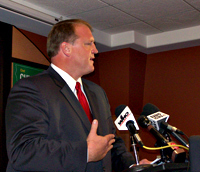 Governor Chet Culver’s campaign billed it as an event to “roll out” Culver’s job creation plans for a second term. But during a news conference in West Des Moines late this morning, Culver suggested that if he’s reelected this November he’ll stay the course with programs already on the books. Culver touts the state’s Iowa Power Fund which hands out state grants to businesses in the biofuels and wind energy industries. The governor envisions plugging more money into the effort next year, but Culver isn’t ready to say whether it will be the $25 million commitment of previous years. Culver’s Republican rival, Terry Branstad, has promised to create 200,000 new jobs over the next five years if he’s reelected. Branstad served as Iowa’s governor from January of 1983 to January of 1999. Culver told reporters this morning he’s unconcerned about comparing his job-creation record to Branstad’s. “He will not have the credibility on some new, exaggerated promise for job creation when he’s never delivered on it in the past,” Culver said. Culver is visiting Newton this afternoon to mark the opening of the “I-GREEN Center” being operated in Newton by Des Moines Area Community College. “We need to go to the next level in terms of those ‘green collar’ job programs,” Culver said this morning in West Des Moines. According to Culver, five of the state’s 15 community colleges have programs specifically focused on training for “green collar” jobs, like the wind energy and turbine technology program at Iowa Lakes Community College. Branstad’s campaign manager says Culver’s comments today are a “tacit admission” his I-JOBS program has been a “complete failure.” Culver did not mention I-JOBS until a reporter asked for the latest I-JOBS data on job creation. Culver cited a previous report which concluded 7000 people were working in June on projects that were financed by I-JOBS grants.